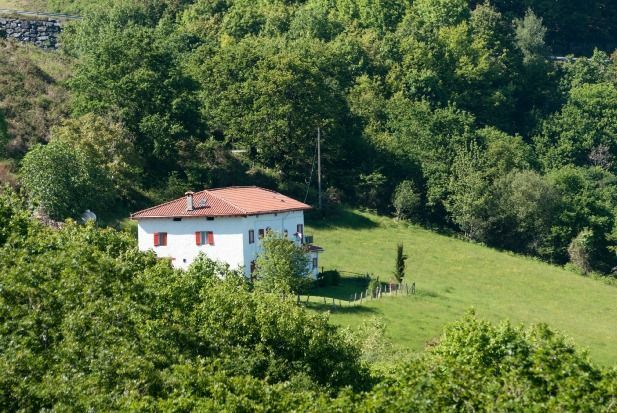 This traditional country house or ‘Caserío’ has been totally reformed and is situated in the heart of nature. On the first floor, it has: 5 double rooms and two bathrooms. On the ground floor: a complete kitchen (microwave + dishwasher), washing machine (on the first floor), lounge-dining room with a fireplace and television. Table tennis. Outdoors: a terrace, a garden furnished with a table, chairs and barbecue and lovely views. A central heating system for you to enjoy the house all year round. Casa situada en plena naturaleza. Perfecta para estar tranquilos. Buena terraza y zona para que jueguen los niños. Lo mejor, las vistas. La dueña es encantadora.